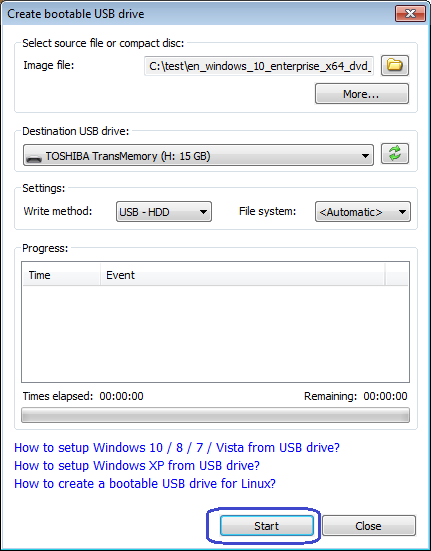 How to setup Windows 10, Windows 7, Windows 8 / 8.1, or Windows Vista from USB drive? 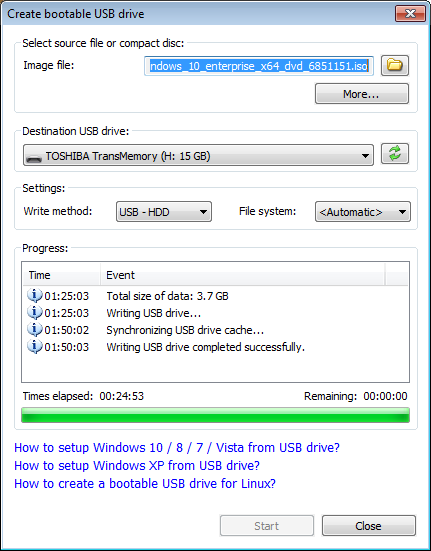 You are here: Tutorials > How to setup Windows 10, Windows 7, Windows 8 / 8.1, or Windows Vista from USB drive? Start PowerISO (v6.5 or newer version, download here). Choose the menu "Tools > Create Bootable USB Drive". The "Create Bootable USB Drive" dialog will popup. If you are using Windows Vista or above operating system, you need confirm the UAC dialog to continue. In "Create Bootable USB Drive" dialog, click "..." button to open the iso file of Windows operating system. 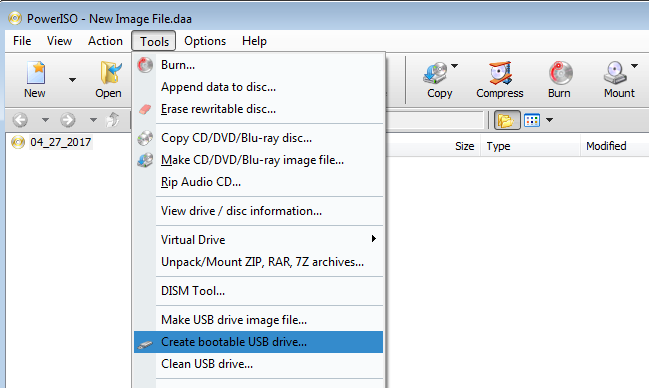 Click "Start" button to start creating bootable USB drive. PowerISO will alert you that all data on USB drive will be destroyed. Click "OK" to continue. The program will start writing USB drive, and showing the progress information. You should get the message "Writing USB drive completed successfully." after the operation completes. If no errors occurred in the above process, you should now be all set to setup Windows from USB drive! Please notice that you can seriously screw up your system by providing incorrect BIOS settings! Assuming that you properly configured your BIOS and your USB drive supports booting, Windows setup should now load. Depending on the speed of your USB drive, this may take a while. Note: The above guide works with Windows 10, Windows 7, Windows 8 / 8.1, or Windows Vista. For Windows XP with SP2 or SP3 please refer to another guide at http://www.poweriso.com/tutorials/how-to-make-winxp-bootable-usb-drive.htm .